Burrows Cabinets’ EVRGRN Specification Guide is available to our customers as a design resource and contains product dimensions, options and specifications. A password is required to open this document. If you are a current Burrows Cabinets customer, please ask your Burrows Cabinets’ representative for the password. 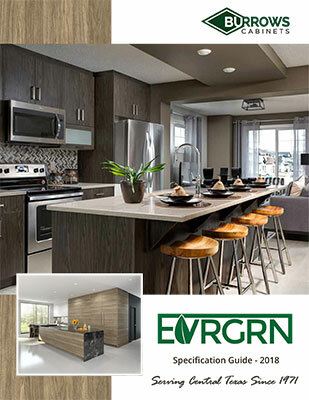 EVRGRN is Burrows Cabinets’ trend-forward, engineered wood product that pairs the beauty and texture of the most sought after, natural wood grains and sophisticated colors with the durability, performance and visual consistency of cutting-edge, engineered material. View our EVRGRN product descriptions, door style selections and color options on our EVRGRN line overview page and view our Faceframe line Here.